This “event season” has seen one technology vendor after another theme their events around Digital or Industrial Transformation. A quick review of the LNS Blog will show how Digital Transformation was an overarching theme at these events. This was not the case at Oracle’s Modern Business Experience. While the Digital Transformation message was mentioned regularly throughout, especially in partnered sessions, this event was all about the Oracle Cloud. Oracle has rewritten its supply chain, ERP, and HR applications from the ground up to maximize performance in the Cloud. Oracle quietly became the first company to have a comprehensive Supply Chain solution in the Cloud. They reported that they had doubled the number of companies that have moved their applications to the Cloud with 2,400 customers, out of a total of 17,000, now firmly in the Cloud. Oracle’s most recent financial report, Q3 FY2019, reported 32% year-over-year growth in their Fusion HCM, ERP, Supply Chain, and Manufacturing Cloud applications. The fundamental advantage of moving to the Cloud was innovation and the speed of innovation. With Oracle reporting that the age of applications in American businesses is now averaging 20-21 years, new systems deliver significant innovation. Also, with a quarterly release schedule on the Cloud, Oracle Cloud users can opt into new features years before they would be able to with an on-premise deployment. Interestingly, several Oracle presenters noted that cost savings were not the primary driver for a Cloud deployment but instead it was innovation. Session after session showcased customers that had moved their business or HR or supply chain applications into the Cloud. The message was so consistent that a Factory of the Future session (partner-driven) was about ERP moving to the Cloud. The Oracle Cloud for ERP and Supply Chain has matured and should be considered ready for mainstream deployment for discrete manufacturers. For process and batch customers, Oracle is building off their discrete solution with an initial focus on mixed-mode manufacturing, primarily for CPG and F&B. They can currently handle sequential workflows, with more complex ones on the roadmap. Co-Products and By-products capabilities will be available with the 19B release. Robust costing and analysis tools were evident. However, production scheduling in the Cloud is still a work in progress. So, while Oracle is on the right track, their supply chain management (SCM) solution functionality in the Cloud has not fully matured. Just how far Oracle plans to extend their Cloud-based SCM solution into the manufacturing operations management (MOM)/ manufacturing execution system (MES) space remains to be seen. 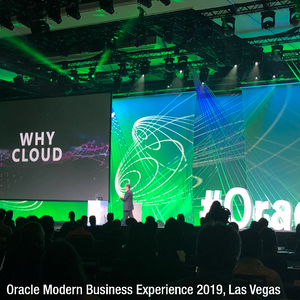 Repeated speakers including Mark Hurd, CEO of Oracle said that the Oracle Cloud “could not be customized, but it can be extended.” The limit on customization led customer after customer to discuss the need to change their processes to conform to the system. Not surprisingly, none of the speakers viewed this as a fundamental issue. All the customers mentioned that the challenge of reengineering processes led them to underestimate the user training requirements of moving to the Cloud. Multiple customers indicated that the drive to the Cloud was secondary to the internal business issue to standardize ERP across their facilities. Most of these corporations had just done a rash of acquisitions and were faced with the question of how to get common business systems across their corporation. They elected to standardize on Oracle because of the Cloud offerings. LNS believes this could be a critical transformational strategy for those companies that do not yet have common business and supply chain solutions across their corporation: leapfrog on-premise standardization and jump to the Cloud for standardization instead. Oracle now has five distinct Industrial Internet of Things (IIoT) applications available on the market including Asset Monitoring, Production Monitoring, Fleet Monitoring, Connected Worker, and Service Monitoring. All these applications come pre-integrated to the Oracle Manufacturing or Supply Chain Cloud. This implies that Oracle has built their IIoT applications on top of a unified data model for operations which has been a significant implementation challenge for IIoT applications generally. Several Oracle speakers mentioned Artificial Intelligence (AI) as a critical technology in the future. They were demonstrating in the exhibition area Adaptive Intelligence for Manufacturing that was released last year. Oracle was positioning these capabilities to optimize assets, production, workers, etc. In that way, the IIoT and AI applications were significant extensions to the Oracle Manufacturing Cloud applications. A specific example of this can be seen in the asset domain. LNS has been writing about asset performance management (APM) 4.0 capabilities. Oracle can provide significant help for customers on their journey towards APM 4.0. In the asset domain, Oracle has architected its IIoT Asset Monitoring application to extend and enhance its Asset Maintenance application. For example, it can automatically or semi-automatically initiate a service ticket in their enterprise asset management (EAM) system and use IIoT collected data to help optimize maintenance schedules via AI. This comprehensive vision and integration demonstrate Oracle’s focus on enabling APM 4.0. Oracle also demonstrated predictive maintenance capabilities for factory assets using real-time and historical data; however, they did not show how to incorporate the asset’s physical properties and maintenance data in their solution. Similarly, Oracle embraced LNS Quality 4.0 vision. Quality 4.0 requires a solid foundation of traditional tech, such as management of core processes and the data from these processes. While Oracle has had success moving traditional Agile quality management capabilities to the Cloud, Oracle’s Cloud strategy is industry-agnostic. This is a logical approach, but LNS expects that its large Agile customer base in life sciences will remain on-premise. Regardless, its sustained focus on quality has resulted in a solution that is positively differentiated versus its tier 1 ERP competition and most, but not all, of the product lifecycle management (PLM) market. However, the real story is its Quality 4.0 tech. Oracle has launched a Global Traceability and Track solution, IoT Production App, Connected Innovation App, Connected Experience App, and Adaptive Digital Manufacturing solution. These Apps provide scalable approaches to deliver many Quality 4.0 use cases, include predictive quality in manufacturing, and digital voice of the customer connected back to product requirements and product definition. These are essential Quality 4.0 use cases, and Oracle’s robust approaches in this area will ease the transition to Quality 4.0 for the next generation of adopters. All in all, LNS views Oracle as a solid partner for companies on their Industrial Transformation journey well beyond their apparent capabilities in the Cloud. Finally, who would have thought that anyone could get thousands of middle-aged techie types to bounce around, waving their hands and shouting “I love Oracle” during a concert. Flo Rida did. The man can put on a show.